A proud #LatinainSTEM, Melissa C. Marquez is a marine biologist who focuses on shark habitat use and movements. She recently completed a Master of Science degree looking into habitat use, preference and defining key Chondrichthyan (shark, skate, ray, and chimaera) life history stages. Melissa has also been on a handful of professional discussion panels and spoken at numerous conferences to discuss her research and outreach. The author of three kid books, Marquez is also a dedicated science communicator who focuses on diverse Chondrichthyan education and on the media coverage of sharks. She is the founder of The Fins United Initiative (www.finsunited.co.nz) and has presented to over 10,000 kids, students, and adults about Chondrichthyan biology, ecology, and conservation since its inception. Originally hailing from San Juan, Puerto Rico, she has moved around the world with her family and to pursue her studies. She is currently living in Wellington, New Zealand and looking worldwide for a PhD opportunity that allows her to understand shark migratory behaviour (why sharks are where they are). You can learn more about her research and qualifications on her website (melissacristinamarquez.weebly.com). Following our successful week in January 2016, Biotweeps are letting the BOU (@IBIS_journal) curate a second week of #ornithology topics. Join us from 10 October as our great volunteer line-up tweet on some great ornithology topics. The week overlaps the BOU one-day conference on ‘avian tracking and remote sensing: advances in methods and applications and tracking’ and several of our days will link to this theme. 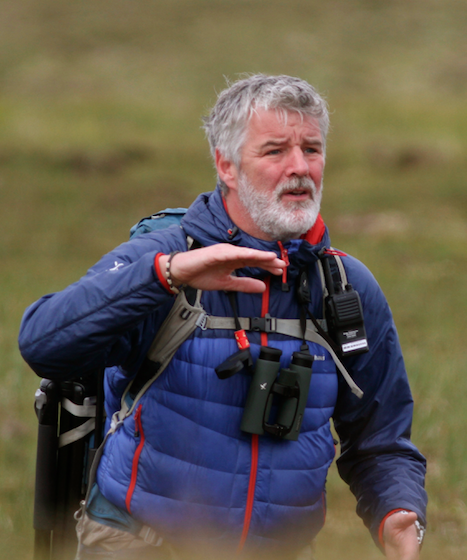 Malcolm is a senior conservation scientist at the RSPB Centre for Conservation Science interested in the ecology of declining birds, the factors that cause declines and applying techniques to reverse them, with a particular passion for woodland birds. Becky is an ecologist at Royal Holloway University of London (royalholloway.ac.uk) and is interested in the challenges that birds face when living in urban environments. She’ll be tweeting about predation pressures (especially from pet cats), the difficulties faced when trying to feed and breed and how you can improve your garden for birds and other wildlife. Tom recently completed his PhD at the University of East Anglia, where he studied the conservation ecology of the European Roller. He is interested in avian population ecology, land-use, migration and conservation. He now works for the RSPB / University of Cambridge, exploring the trade-off between agricultural production and bird numbers in the UK. Christopher Heward works as a research assistant for the Game and Wildlife Conservation Trust and is a PhD student at the University of Nottingham. His current research covers a broad range of different topics but is focussed upon a single species: the Eurasian Woodcock. Rob is a Senior Lecturer at the Cardiff School of Biosciences. His research group studies animal behaviour in changing environments. The environmental changes that they study range from long-term climate changes, through seasonal and daily changes, to the sudden appearance of a potential predator or an unfamiliar type of food. Renata is a Lecturer at the Cardiff School of Biosciences and part of Rob Thomas’s research group studying animal behaviour in changing environments. 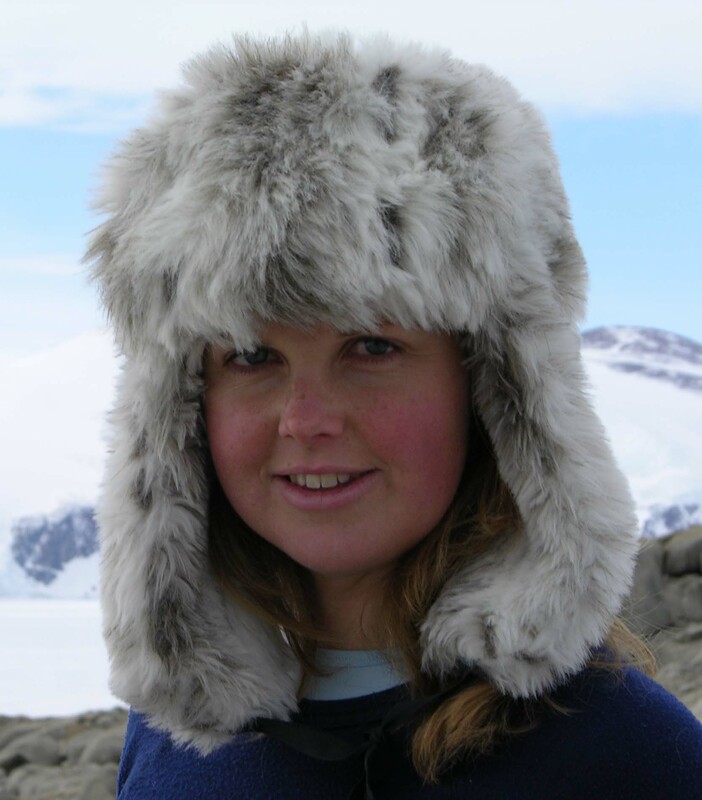 Her main research interests are related to seabird ecology and climate change. 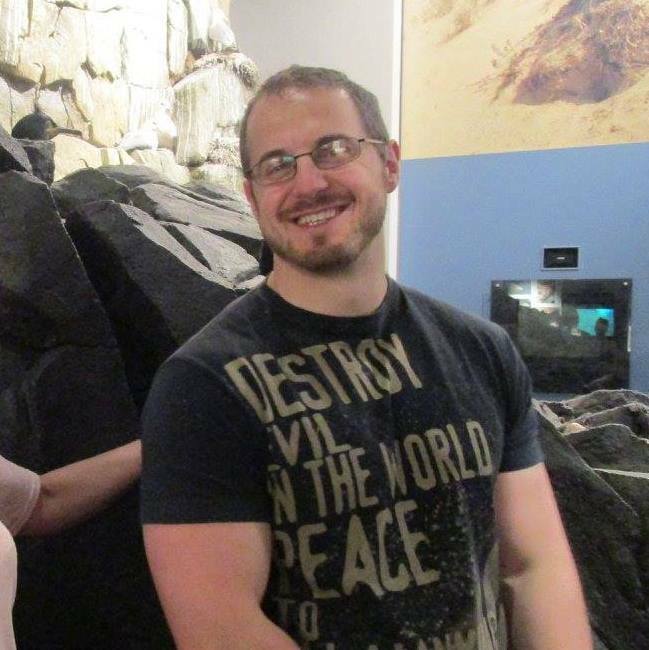 Auriel Fournier is a PhD Candidate with the Arkansas Cooperative Fish and Wildlife Research Unit at the University of Arkansas. She got her start in birds and rails while growing up in northwest Ohio working with Black Swamp Bird Observatory. From there she received her B.S. in Wildlife Ecology and Management from Michigan Technological University in the Upper Peninsula of Michigan and has been working on migratory bird questions ever since. She is passionate about wetlands, birds and trying to understand their migration while making the conservation and scientific communities studying them more diverse. I am an ecologist with a range of interests mainly related to migration and foraging ecology of vertebrates (particularly birds) and the application of stable isotope techniques in animal ecology. My research focuses on spatial and trophic ecology of animals, with a particular interest in the causes and consequences of intra-population variation in foraging and dispersal behaviours. 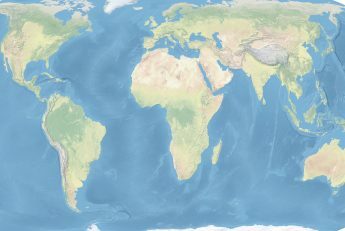 My research group works on a range of study systems at field sites all over the world: Sub-Antarctic New Zealand, South Atlantic, Portugal, Germany, Iceland, Great Britain (including Shetland, St Kilda), Northern Ireland & ROI, the Bahamas, USA, Canadian Arctic and the central Pacific. A major focus over the last 10 years or so has been establishing a long-term study of light-bellied Brent geese with the Irish Brent Goose Research Group and colleagues in Iceland. We have marked over 4000 individuals in Ireland, Iceland and in their Arctic breeding grounds in Canada. We will be conducting fieldwork during the course of the week and so stories of these birds will feature in my tweets. Although research is what first attracted me to academia I see teaching as one of the most important and rewarding aspects of my job. My research interests and field experience give me a broad range of experiences to draw upon in my teaching and I incorporate research from my group in many of the lectures and practical sessions that I deliver. I’m a PhD Candidate with the Arkansas Cooperative Fish and Wildlife Research Unit at the University of Arkansas. 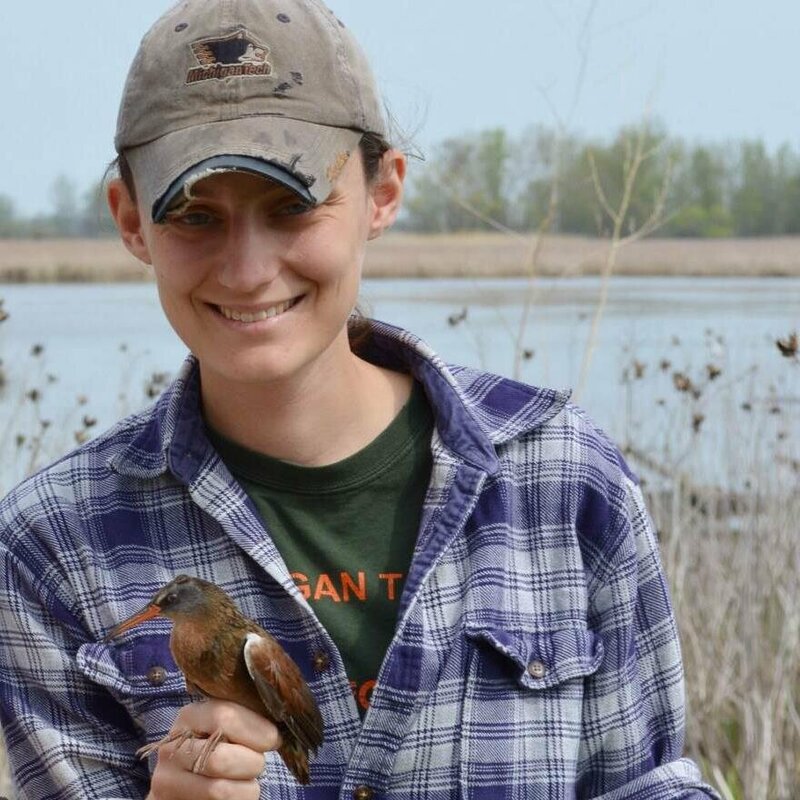 I’m passionate about bird migration and wetlands and my research focuses on trying to understand how wetland management in the fall impacts different bird communities. My current focus is on rails, a type of secretive wetland bird. I’m also very passionate about diversity (race, gender, sexual orientation, etc) in science. 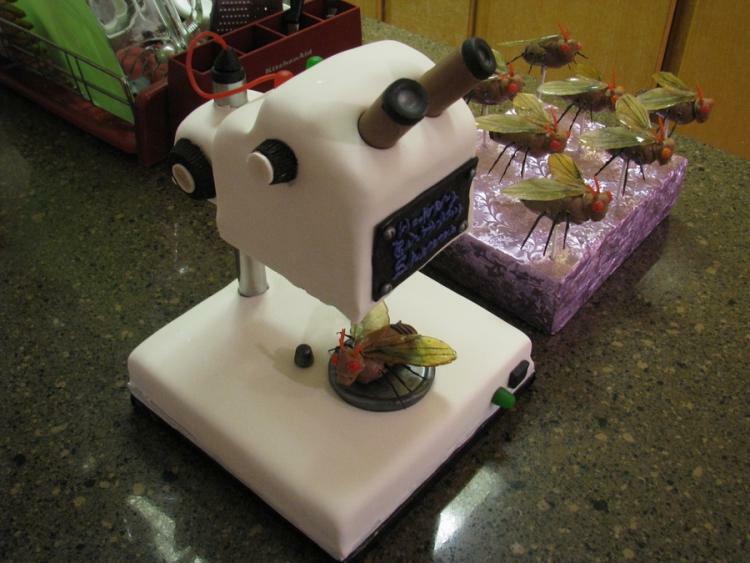 An awesome microscope cake by Doughking. Has it really been one year already? Apparently so. 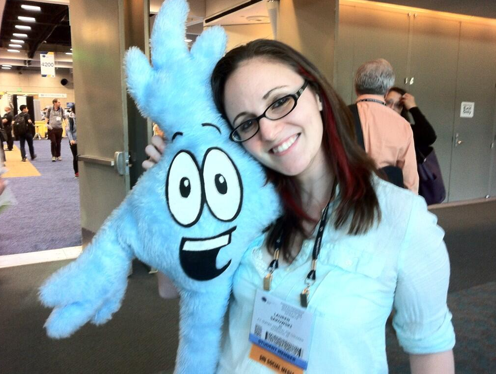 If I’m entirely honest, when I decided to create Biotweeps, though I had ambitions for it to become a long-running science communication project, I had considerable doubts about whether it would get off the ground. I had put in a decent amount of groundwork with regards to promotion and contacting potential contributors, but I was still sceptical. Then people started signing up. The first few months were full within no time, and, as the schedule filled, I became more optimistic that it might – just might – reach its first birthday. It turns out that we made it, and comfortably at that. The first year hasn’t been perfect, of course. There are numerous things that I, personally, could probably have done better. Fortunately, the feedback from contributors and followers has been overwhelmingly positive so perhaps I’m being too hard on myself. That said, expanding the international audience and getting contributors from other countries are high on my ‘to-do’ list (if you’d like to help out in this regard, please do get in touch), along with possibly starting one or two associated projects. But more on those in the fullness of time. It behooves me, then, to thank all the contributors for taking the time to talk about their science and interests, and our followers, who grow in number on a daily basis. The project was conceived for you, and I’m so glad that you’re all making the most of it. Specific thanks to @CarinaDSLR for her support early-on, and @MCeeP and @smiffy for their contributions. To celebrate our first birthday, we’re having a slightly different week, here on Biotweeps. Instead of one contributor, we have 5, one on each week day. You can read more about this weeks Biotweeps, below. I am a third-year PhD candidate at Queen’s University Belfast, Northern Ireland, where I’m studying hares; more specifically, the invasive European hare (Lepus europaeus) and its potential impacts on the endemic Irish hare (L. timidus hibernicus). You can view the QUB project page here, or the project Facebook page, here. You can follow/contact me on Twitter at @thonoir, or via other social media which are linked on my website. My research interests include invasive species ecology, population ecology, biodiversity conservation, community ecology, animal communication and behavioural ecology. I am a keen supporter of science communication and as such I am a UK STEM ambassador, founded the curated Twitter account Biotweeps, and took part in the outreach project I’m a Scientist, Get Me Out of Here in 2013. Holly is studying seabird migration and behavioural ecology. She has spent the last four years working with UK seabirds as part of her DPhil in the Department of Zoology, Oxford University. She uses a range of biologging methods (GPS, geolocation and TDR) to track the movement and behaviour of several seabird species, including puffins, razorbills, guillemots and kittiwakes. I attended Mount St. Mary’s University and University of Delaware and have a background in molecular biology and neuroscience. I began freelancing in the summer of 2014 and have been freelancing full time since the spring of 2015. My main area of interest is inflammation in the central nervous system and how it ties into neurological disorders (neurodegenerative diseases and depression/anxiety). I’m interested in understanding why animals of the same species seem to vary so much. Why are some bigger than others? Why do some live longer? Why are some so susceptible to infections? Is this variation due to genetic differences or variation in the environment? Animals have limited energy which they must divide between growing, reproducing, rearing offspring and immunity to parasites. These characteristics all affect the number of offspring they produce, and through natural selection, genetic variation in such characteristics leads to evolution. In wild populations, animals vary hugely in how many parasites they harbour. 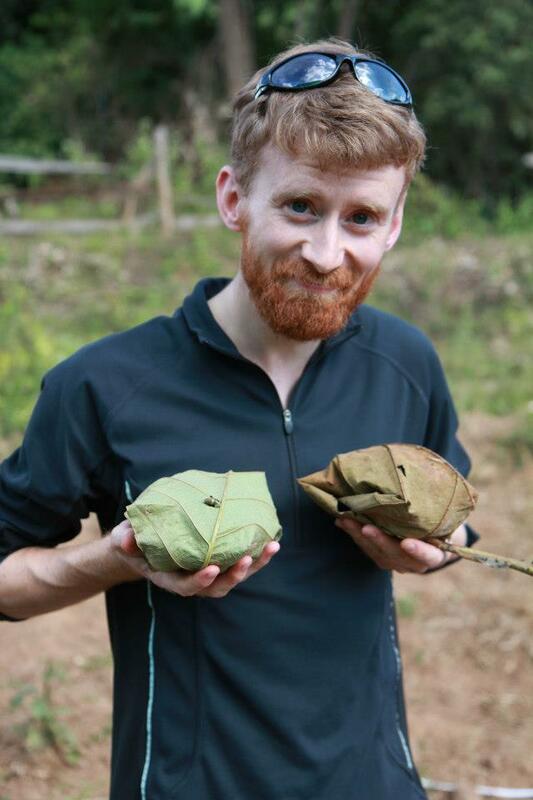 I’m an evolutionary ecologist by training, and have spent time doing fieldwork on sheep on a remote Scottish island, and on elephants in the Burmese jungle. I find the struggle between parasites and their hosts absolutely fascinating, and the diversity of life-cycles that parasites have evolved truly staggering. I’m looking forward to talking about how hosts and parasites are continually evolving to get on top and how studies in the wild can help us to understand these interactions better. I’m a marine biologist/geneticist living in New Zealand and mad keen on studying fish and shellfish. I am researching the effects of increases in temperature, ocean acidification and pollution because the effects of climate change are something we should all worry about. I’m also fascinated by epigenetics and the role of the microbiome. I work part-time, mum full-time and am also incredibly interested in the science of parenting. I am a physiological ecologist. My research focuses on the costs and drivers of migratory strategies in vertebrates using techniques such as satellite telemetry and physiological measurements, including respirometry. My work has also focused on the impact of external forcing factors, such as climate change and disease ecology, on migration and breeding ecology. I studied marine turtles for my PhD, the fantastic bar-headed goose for my post doc, and along the way I have been working with basking sharks and blue sharks, song birds, grey seals, flour beetles and garden snails. My future research will make inroads into mega-vertebrate migratory physiology using emerging technologies and multi-technique approaches like heart rate logging and accelerometry.